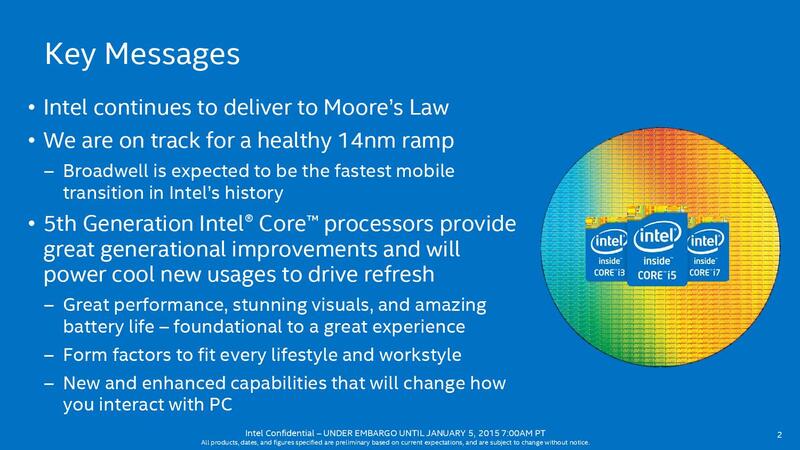 The wait is over: So far only the ultra fugal Core M models of Intel's new 14 nm generation called Broadwell have been available. 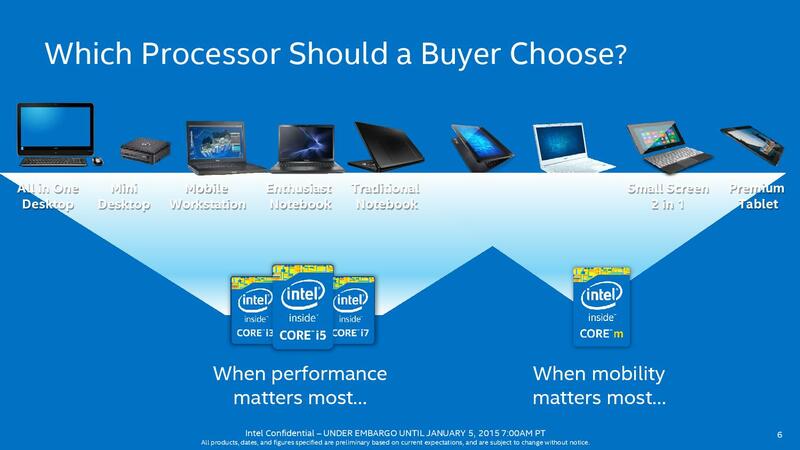 More powerful models for bigger notebooks and ultrabooks are following now. 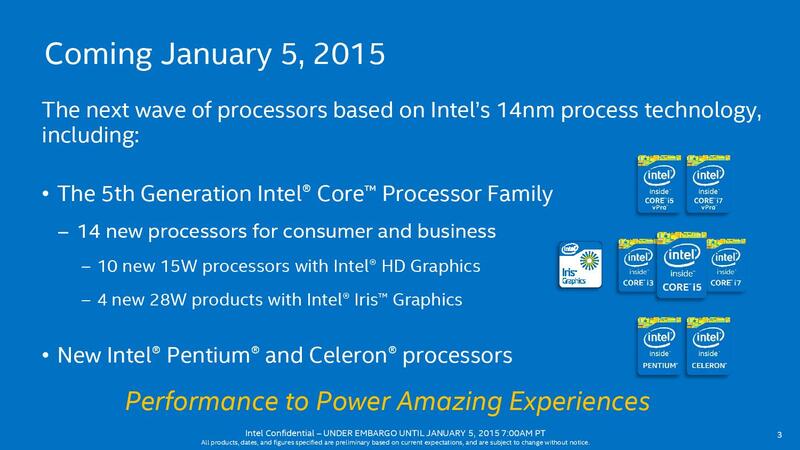 A total of 17 new models with a TDP of 15 or 28 Watt replace the previous Haswell generation. 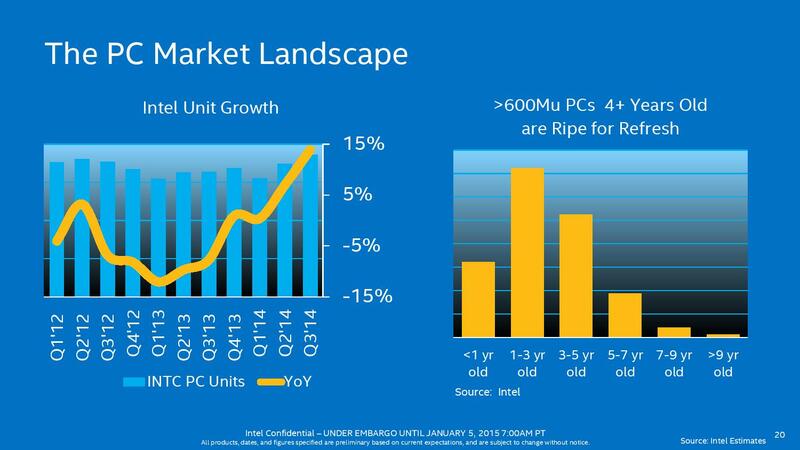 A year and a half is quite a long time in the fast-moving IT business. More than 18 months ago, Intel unveiled a new CPU generation in the (ultra) low voltage segment. 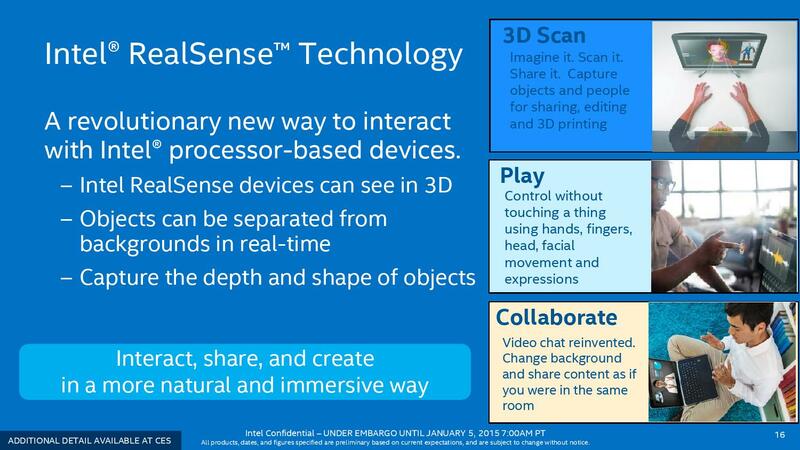 While the performance of the fastest Haswell chips is still nothing to sneeze at, development has continued: Faster graphics solutions, finer lithography and new features make moving to an improved architecture unavoidable. 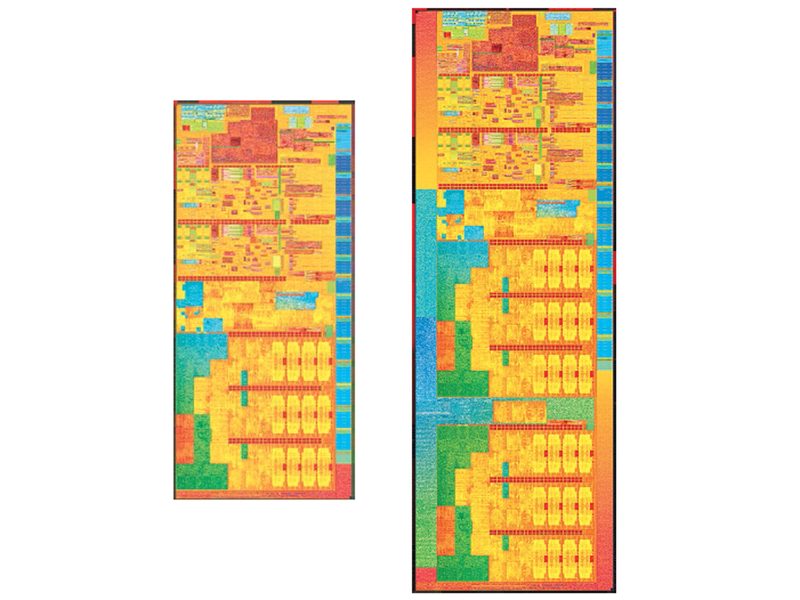 What innovations dos Broadwell bring in detail? 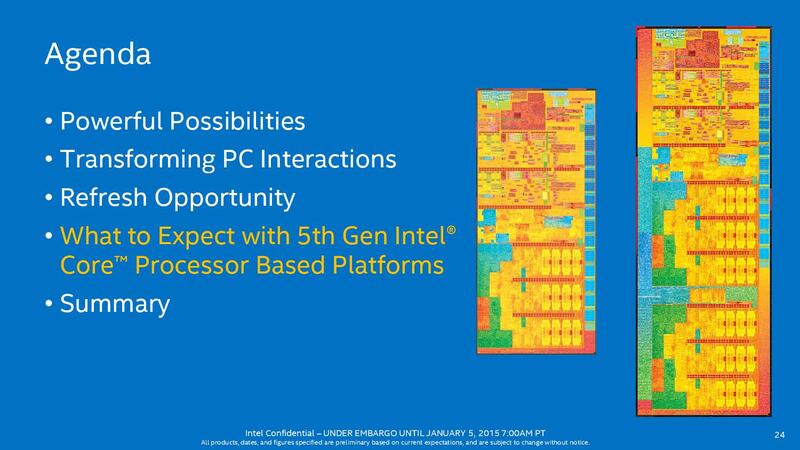 According to Intel's Tick-Tock strategy, Broadwell is the Tick, i.e. 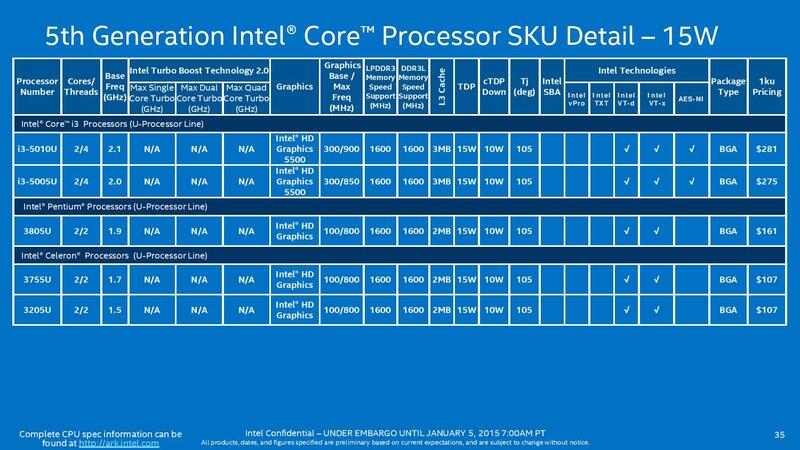 only a slightly revised edition of Haswell (22 nm) with a smaller 14 nm process. 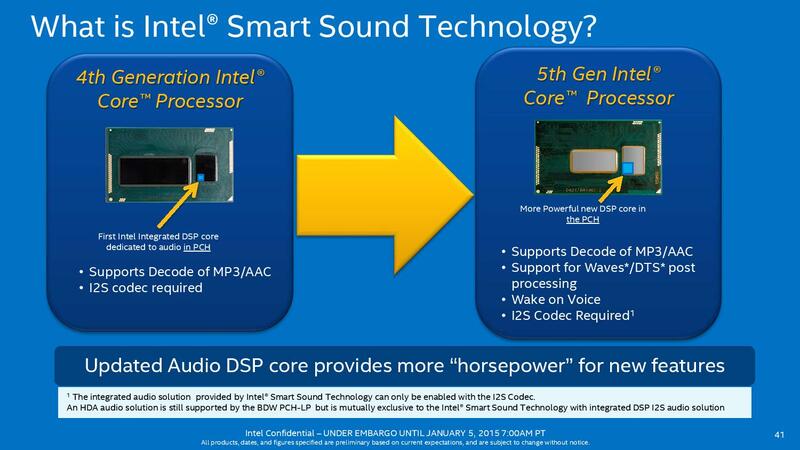 Accordingly, the performance per MHz is only slightly higher by about 5 percent. 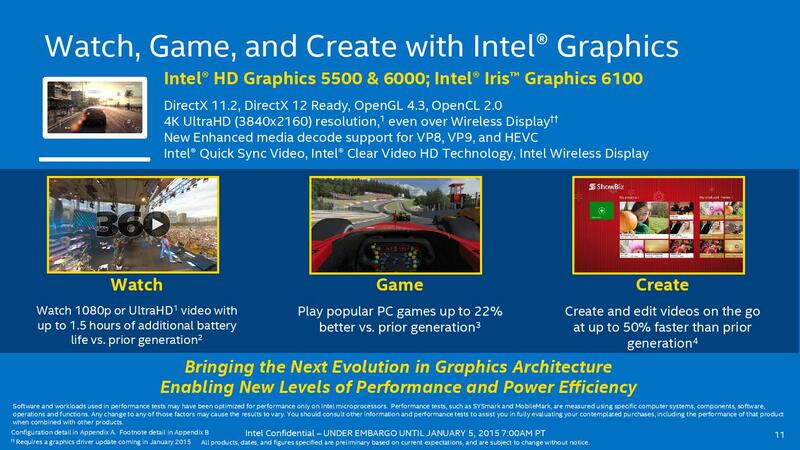 Bigger performance gains are only expected for the graphics unit. In addition, there are new or improved features like 4K support for wireless display transmissions (WiDi) or a video decoder which supports H.265 now. 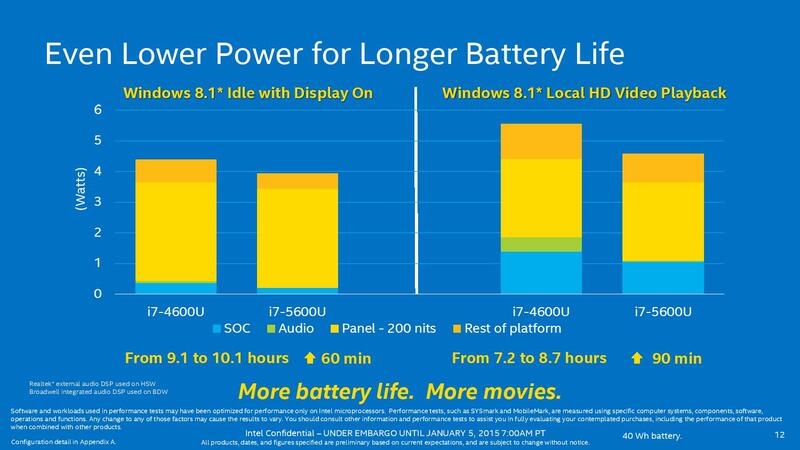 Thanks to lower power consumption while idle or under partial load, battery life should increase, too. 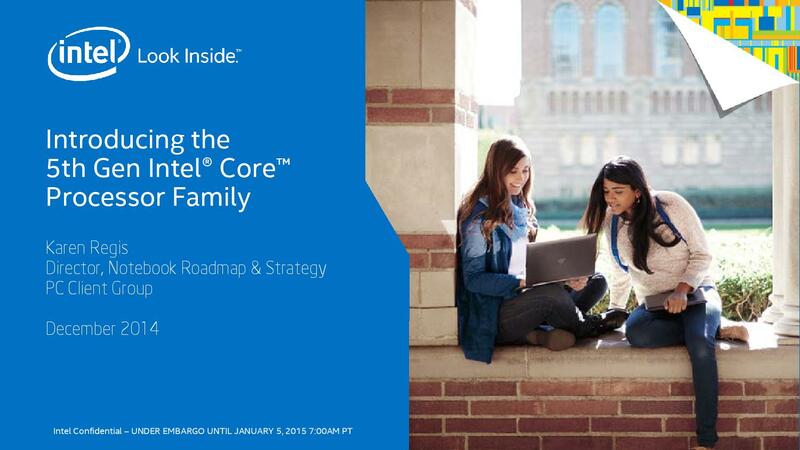 Please refer to out recently published Core-M article if you want detailed information about the changes. 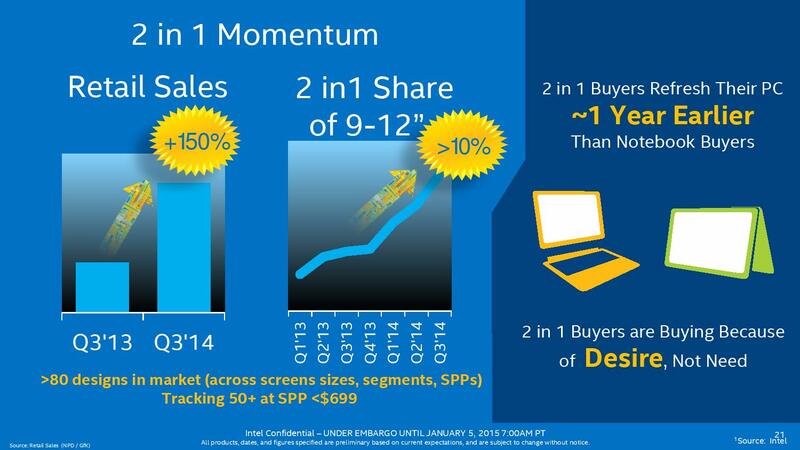 In the following we will primarily cover the product line-up and try a first performance estimation. 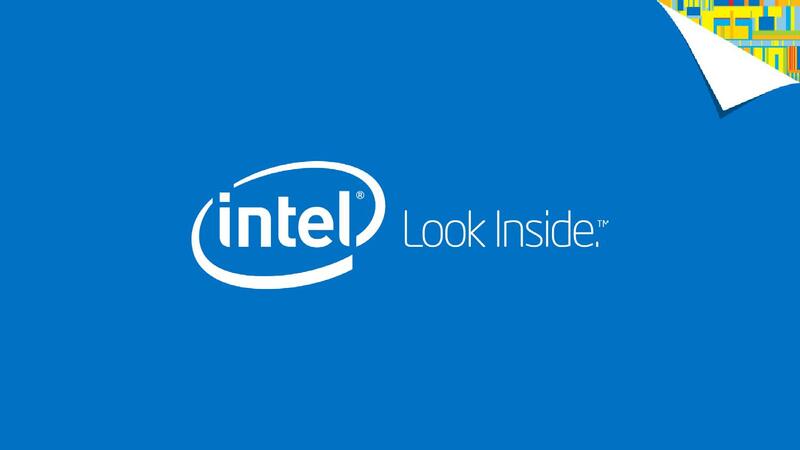 Most of the recently introduced processors, more precisely 13 of a total of 17 models, belong to the popular 15 Watt class. 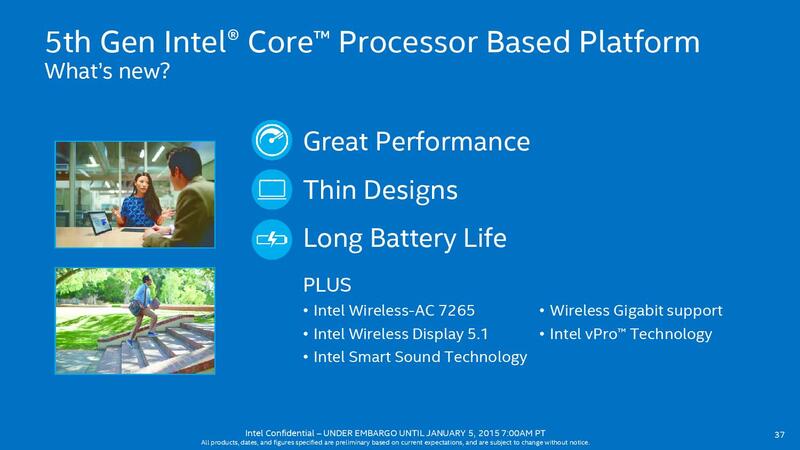 CPUs of this TDP category are suitable for small ultrabooks to about 17 inch displays, but are also used in significantly bigger notebooks. 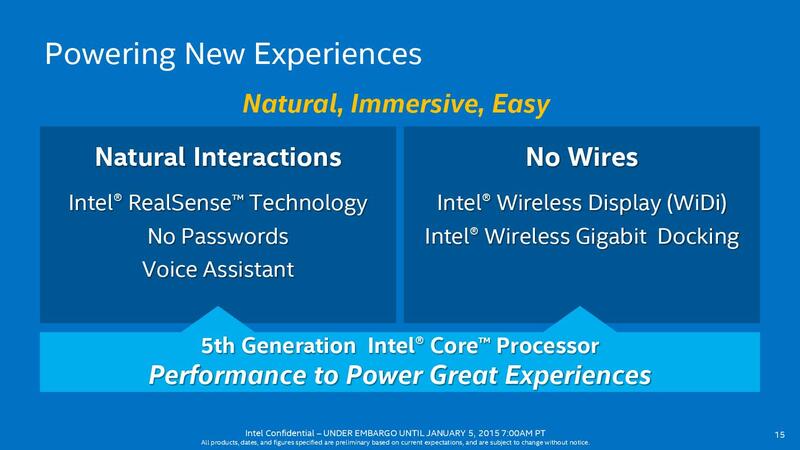 Similar to Haswell, Intel distinguishes the models by processor performance and graphics unit. There are four top of the line models with HD Graphics 6000 (GT3, 48 EUs), which replace the previous HD Graphics 5000 (40 EUs). 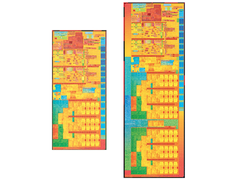 Thanks to a 14 nm process, the manufacturer could shrink the die size from 181 to 133 mm², although the number of transistors have increased from 1.3 to 1.9 billion. 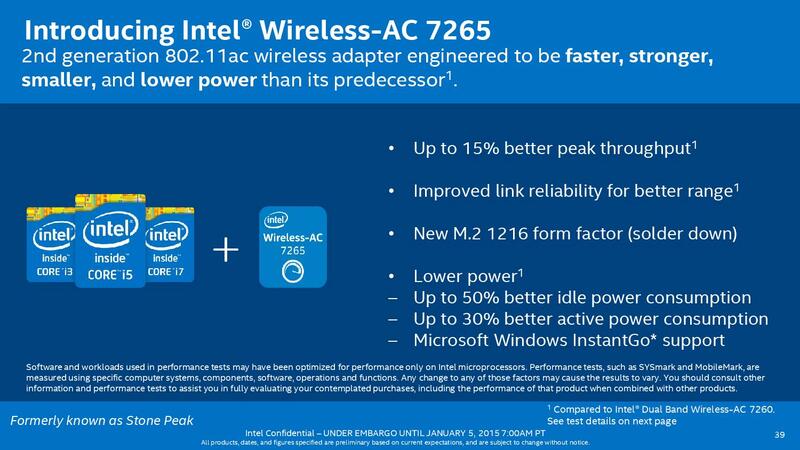 Another advantage: Depending on the model, the base clock has increased by 300 to 500 MHz compared to the predecessor, which outlines the enormous efficiency gain due to the new process. 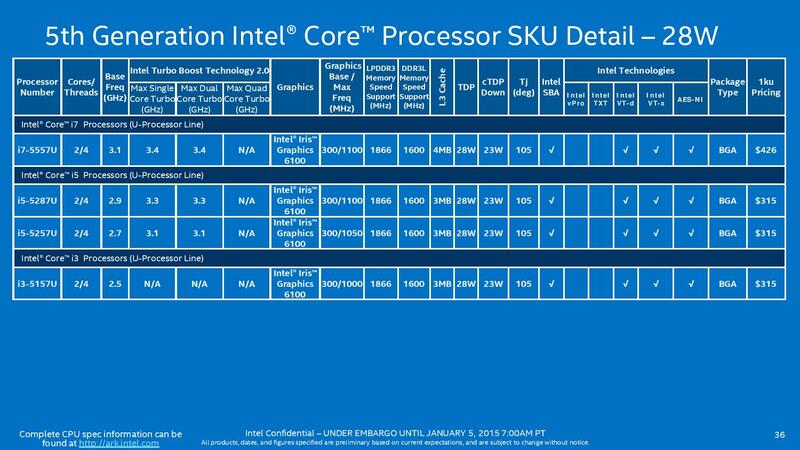 The increases in each Turbo level are a bit more disappointing: While the maximum clocks when 2 cores are used are slightly higher on average, single core boost stagnated or partly even fell by 100 MHz. 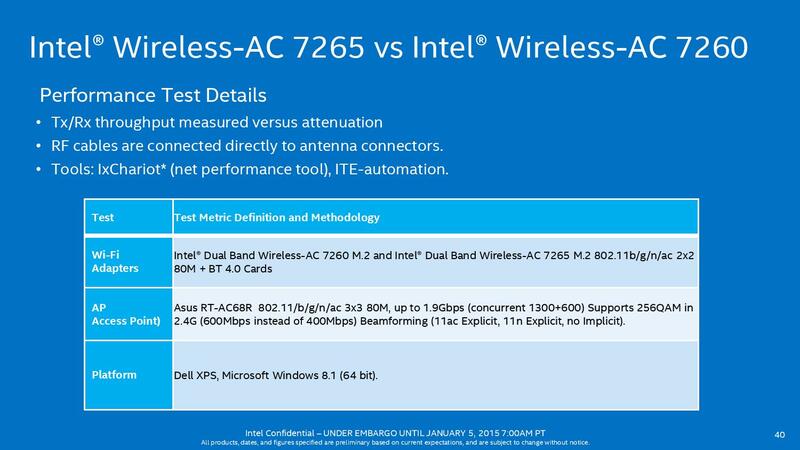 The increased performance per MHz might compensate this, but Broadwell may be unable to bring the expected added value in this aspect. 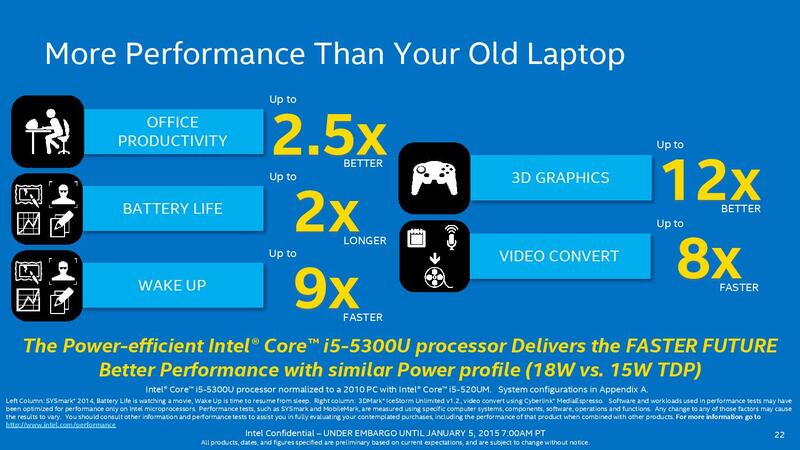 The potential of the GPU is more promising, especially if notebook manufacturers use LPDDR3-1866-memory, which is supported for the first time beyond the standard DDR3L 1600 MHz. 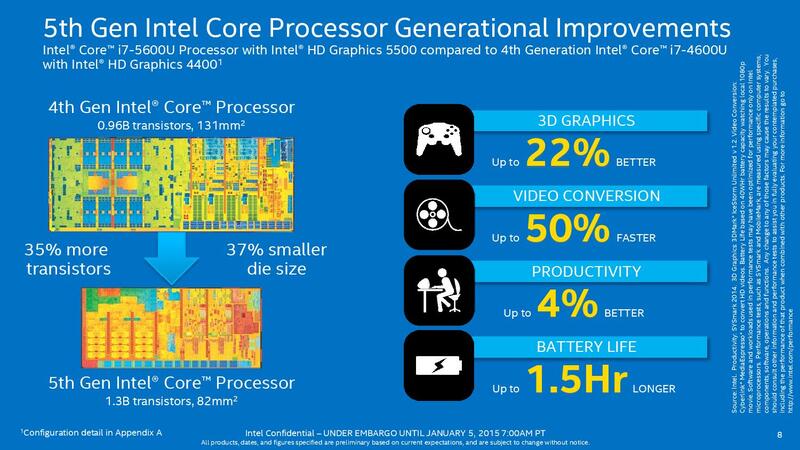 The popular HD Graphics 4400 (20 EUs) is replaced by the HD Graphics 5500 (GT2, 24 EUs), a higher clocked model of the HD Graphics 5300 of the Core M series. 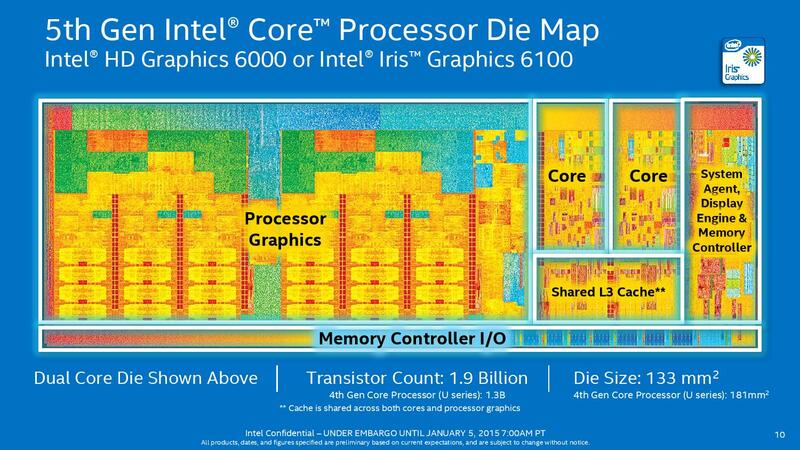 Supposedly, they use exactly the same die, since Intel specified the same characteristics (1.3 billion transistors, 82 mm² die size) for both series. 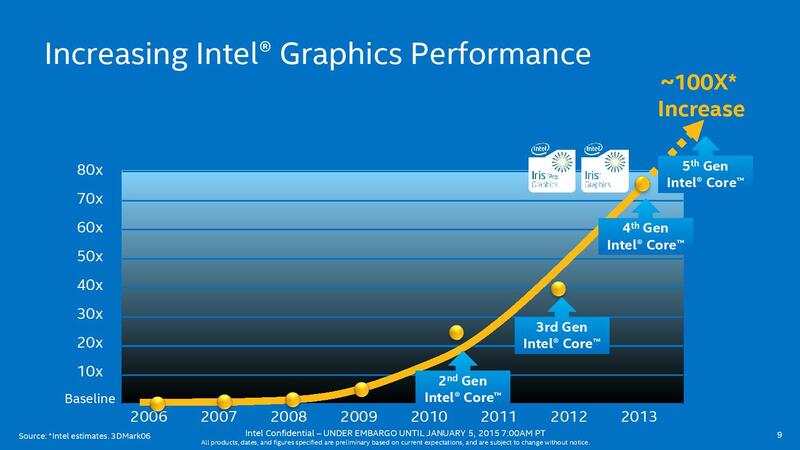 The expected CPU performance gain is small, since the clock frequencies have been only marginally increased compared to the predecessor. Only during combined CPU and GPU load may Broadwell have a chance to achieve noteworthy advantages due to better utilization of the TDP budget. 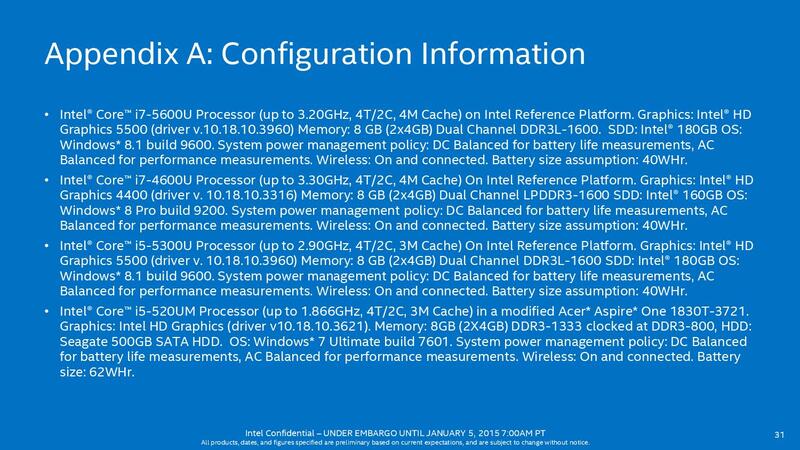 Strange: The two Core i3 models have only 23 EUs enabled - apparently Intel wants to sell partly defective chips this way. 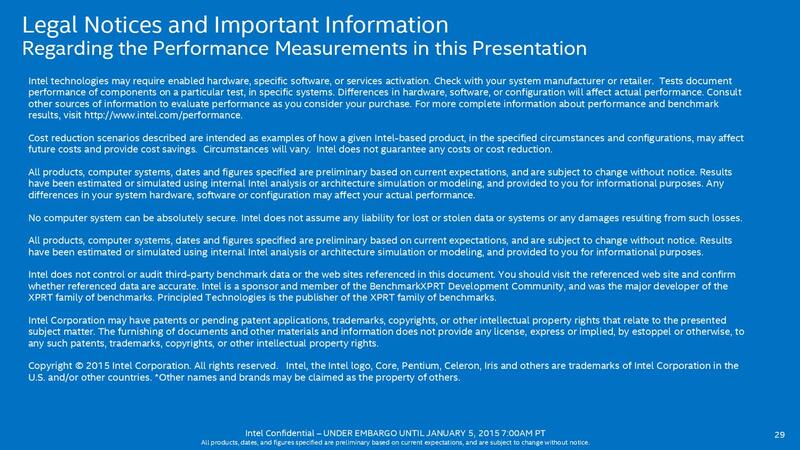 However, the performance penalty should be marginal. 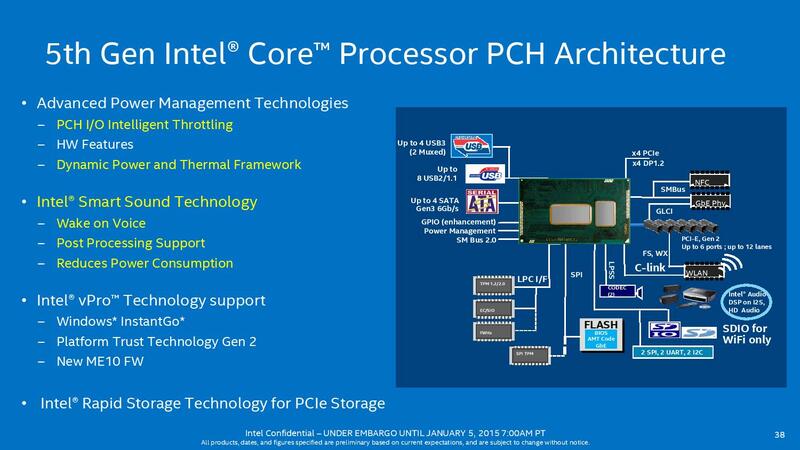 At the lowest end of the model range there are the usual Pentium and Celeron processors without CPU Turbo or Hyperthreading. 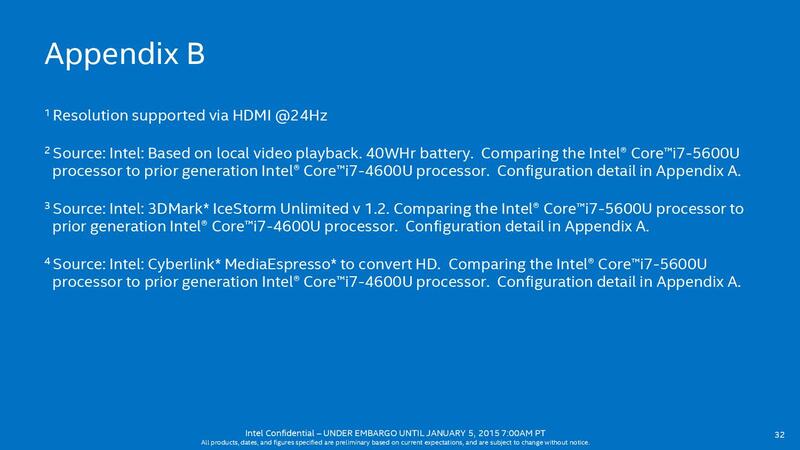 Similar to the bigger Broadwell GPUs, the HD Graphics (Broadwell) (GT1, 12 EUs) should bring a performance gain of about 20 percent compared the the corresponding Haswell counterpart, while CPU performance will presumably increase ever so slightly. 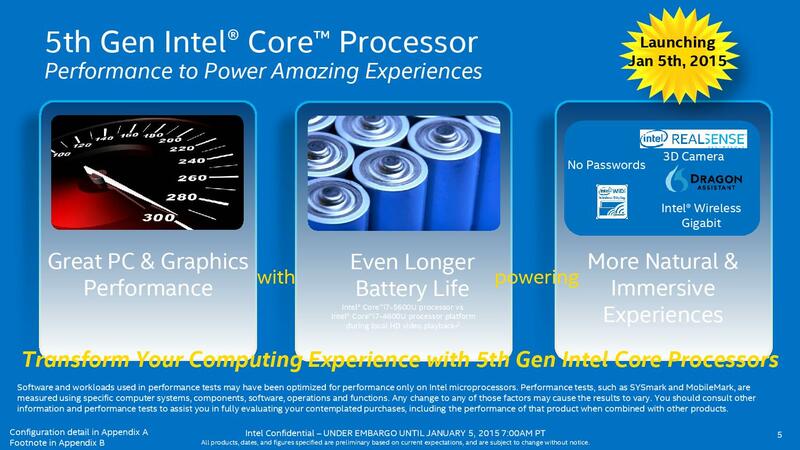 The more powerful 28 Watt processors for bigger ultrabooks eked out a niche existence with Haswell. Nevertheless, Intel continues the series with Broadwell. 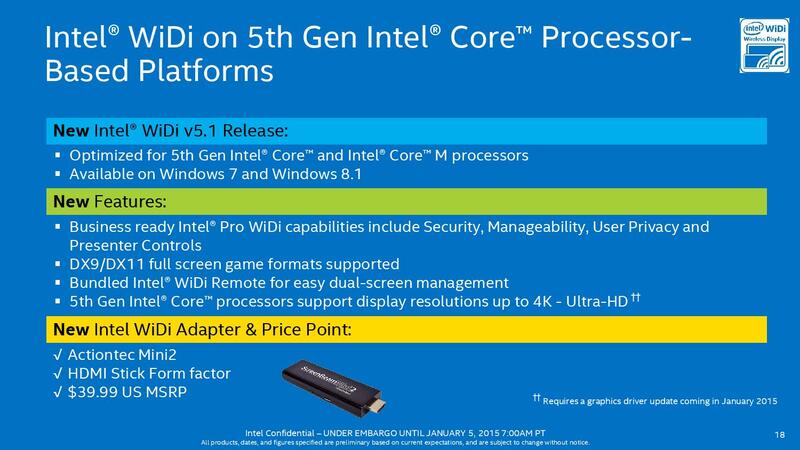 Basically, they are just higher clocked 15 Watt models with a GT3 graphics unit called Iris Graphics 6100 instead of HD Graphics 6000. 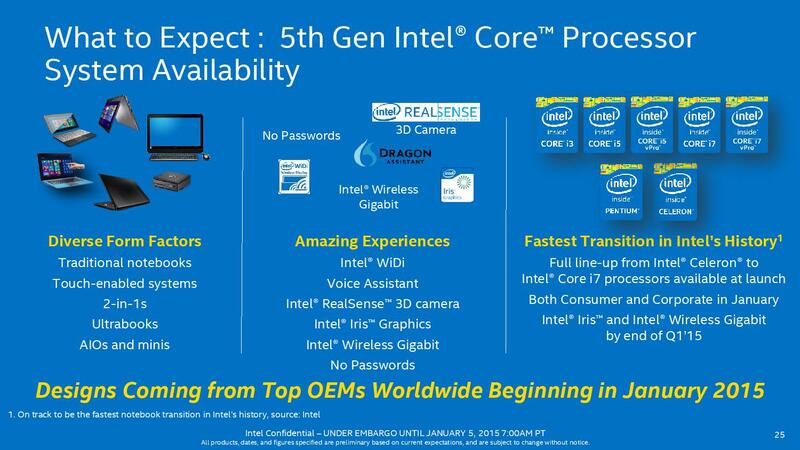 Intel promises an especially rapid move from Haswell to Broadwell. 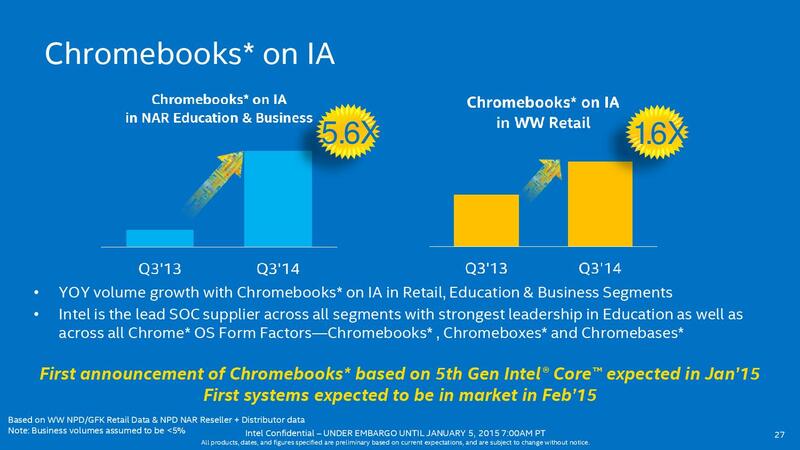 Many big OEMs will present their revised notebook models at CES 2015. 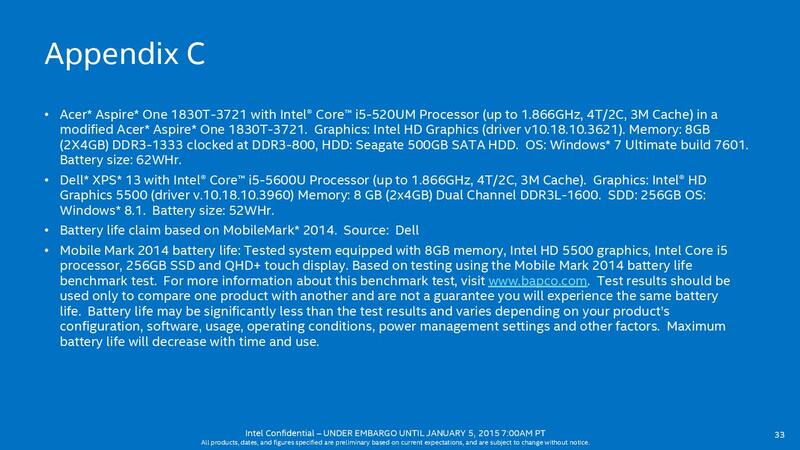 Several online shops are already listing Broadwell models of the Asus Zenbook UX303LA and UX303LN. 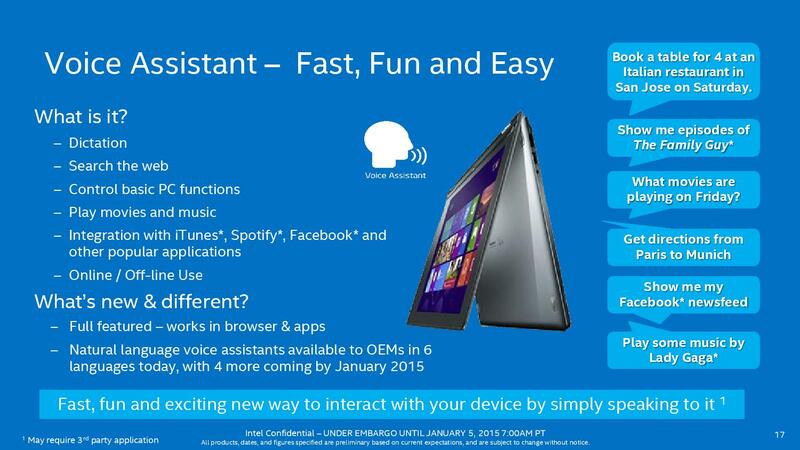 In addition, new models of the Acer Aspire R13 have already been sighted. 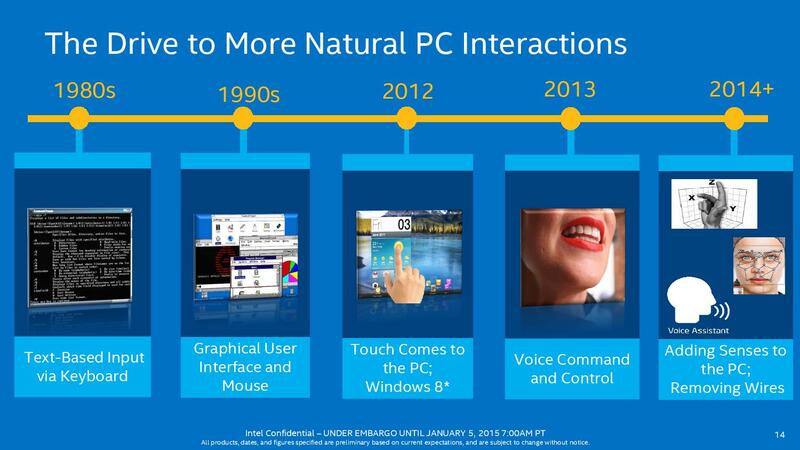 Accordingly, first devices should be available soon. 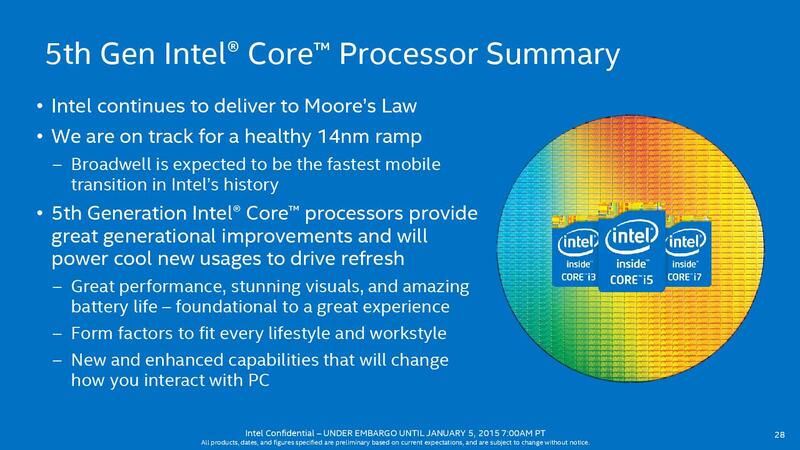 Those waiting for new standard voltage processors, especially for Broadwell based quad-core models, have to wait a bit longer. 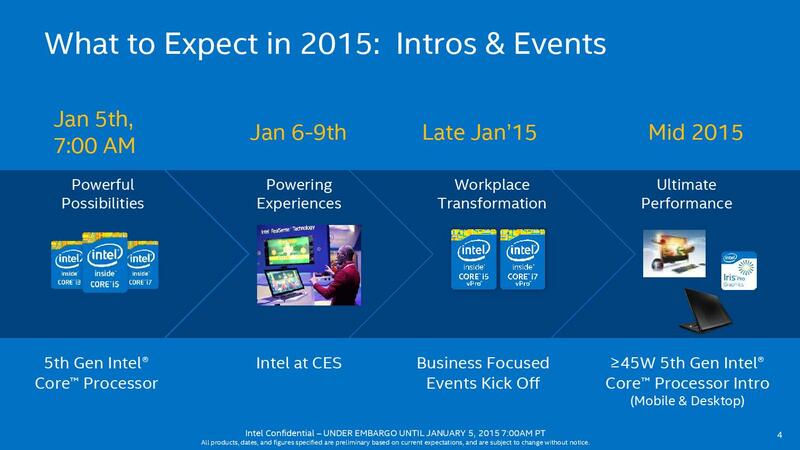 According to Intel's current roadmap they will be released mid 2015. 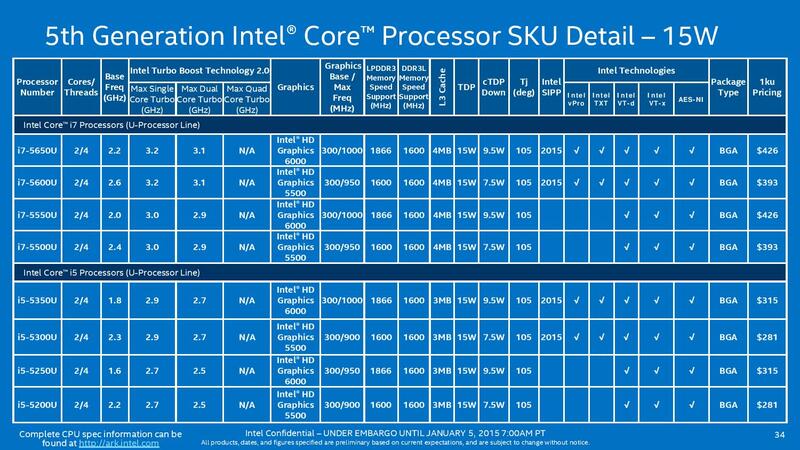 At the same time, the next microarchitecture called Skylake is still slated for the second half of the year. 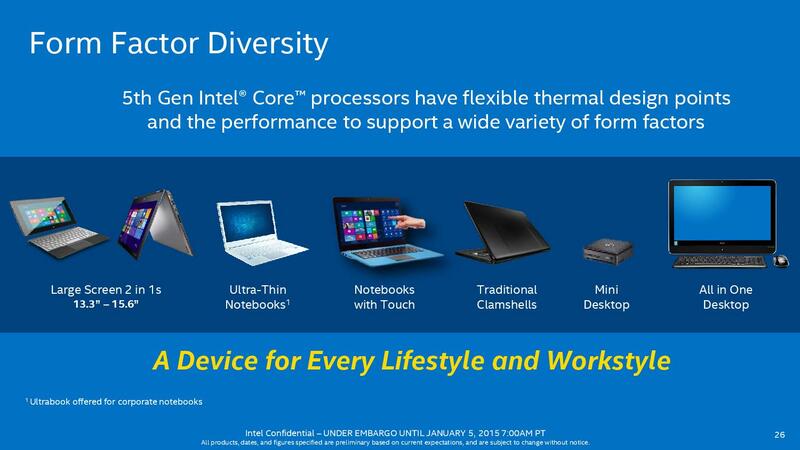 We are excited to see how fast Skylake models will be available in the notebook range.